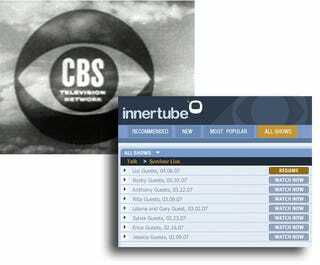 CBS Corporation announced a big jump onto Web distribution with its CBS Interactive Audience Network. The company has inked deals with a cornucopia of online distributors, and starting this summer, CBS programming content will be spread all over the Internet far and wide. The shows will have ads attached, and the idea is instead of making you come to a single portal to get its shows as NBC does, CBS will be posting its shows to places many viewers are already going on the Interwebs. Who is, and who isn't participating in this big deal? There's a long list of companies in on this. The lawyers must've had a field day, signing up titans such as AOL, Microsoft, CNet Networks, Comcast, Bebo, TiVo, Brightcove, Netvibes, Joost and Sling Media, too. And don't forget, CBS already has already existing deals with Amazon, Apple and Yahoo. CBS will share the ad revenue with these distributors. Speaking of Sling Media, that company plans more than just a video portal; it's going to allow playback through SlingPlayer software, and the idea is also to get content from the internet to TV via its SlingCatcher. Plus, users will be able to share that content with each other, bandwidth permitting, of course. "This is definitely a progressive approach to content distribution, not only due to its scope, but also because it allows consumers to share and engage with content," said Curt Hecht, chief digital officer at GM Planworks and a leading digital expert across Starcom MediaVest Group. Noticeably missing from the list was YouTube.